In a paper published in the autumn issue of History Workshop Journal Dr Amy Erickson unravels the fascinating history of the titles used to address women. Her research reveals the subtle and surprising shifts that have taken place in the usage of those ubiquitous M-words. ‘Mistress’ is the root word of both of the abbreviations ‘Mrs’ and ‘Miss’, just as Mr is an abbreviation of ‘Master’. The ways that words derived from Mistress have developed their own meanings is fascinating and shifts in these meanings can tell us a lot about the changing status of women." In July composer Judith Weir was named as the first woman to hold the post of Master of the Queen’s Music, following in the footsteps of dozens of eminent male musicians with the same title. The Guardian reported that “the palace never even suggested ‘mistress’ of the Queen's music and neither did she”. Research by Cambridge University historian Dr Amy Erickson, published in the autumn issue of History Workshop Journal, unravels the complex history of an extraordinarily slippery word and suggests that the title of Mrs, pronounced ‘mistress’, was for centuries applied to all adult women of higher social status, whether married or not. Erickson’s inquiries into forms of female address emerged from her study of women’s employment before the advent of the national census in 1801. What she found in registers, records and archives led her to question existing assumptions and track the changes that have taken place in the history of titles. Neither ‘mistress’ nor ‘Mrs’ bore any marital connotation whatsoever for Dr Johnson. When in 1784 he wrote about having dinner with his friends “Mrs Carter, Miss Hannah More and Miss Fanny Burney”, all three women were unmarried. Elizabeth Carter, a distinguished scholar and lifelong friend of Johnson’s, was his own age and was invariably known as Mrs Carter; Hannah More and Fanny Burney were much younger and used the new style Miss. Erickson’s investigations have revealed that ‘Miss’ was adopted by adult women for the first time in the middle of the 18th century. Before that, Miss was only used for girls, in the way that Master is only ever (today increasingly rarely) used for boys. To refer to an adult woman as a ‘Miss’ was to imply she was a prostitute. She explains: “Until the 19th century, most women did not have any prefix before their name. Mrs and, later, Miss were both restricted to those of higher social standing. Women on the bottom rungs of the social scale were addressed simply by their names. Thus, in a large household the housekeeper might be Mrs Green, while the scullery maid was simply Molly and the woman who came in to do the laundry was Tom Black's wife or Betty Black. 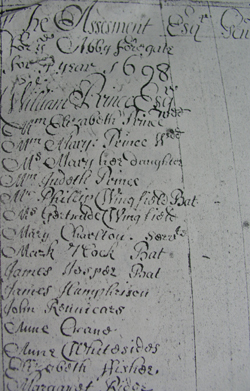 A 1698 tax list from Shrewsbury lists from the top: William Prince Esqr Mm [Madam] Elizabeth Prince Wdd [widow] Mm Mary Prince Wdd Ms [mistress] Mary her daughter Mm Judeth Prince Mr Philip Wingfield Bat [baronet] Ms Gertrude Wingfield [who is either the wife or the daughter of Mr Wingfield above] followed by a number of women below with only a first and last name. This example shows that not all women had a title in front of their name, and demonstrates the use of Ms for an unmarried women (Mary Prince) and for a woman whose marital status is unclear (Gertrude Wingfield). Madam appears to be used here as the title for married/widowed women of social standing. This trend was probably fuelled by the novels of the 1740s such as those by Samuel Richardson, Henry Fielding and Sarah Fielding, which featured young gentry Misses and upper (single) servants titled Mrs. The boundaries between the old and new styles are blurred, but Mrs did not definitively signify a married woman until around 1900. To many women in the late 20th century, the practice of replacing her first name by his first name added insult to injury. That's why this form of address was satirised as “Mrs Man", and why it has dropped out of use in all but the most socially conservative circles – except of course where a couple are addressed jointly. The introduction of Ms as a neutral alternative to 'Miss' or 'Mrs', and the direct equivalent of 'Mr', was proposed as early as 1901. The question of which titles are appropriate for which women is likely to remain hotly contested. In 2012 the mayor of Cesson-Sevigne, a town in France, banned the use of ‘mademoiselle’ (the French equivalent of ‘Miss’), in favour of madame (the equivalent of ‘Mrs’), which would be applied to all women, whether married or not, and regardless of age. The proposal has not met with universal favour. Some women protested that calling an adult woman ‘mademoiselle’ was a compliment.